Fantastic music, action, suspense, and the kind of party you wish would never end – Blind Orchestra is all that and more. Blind Orchestra is the disappearing moment, the intricate design of a snowflake melting on your tongue, a dreamlike dance into the unknown, the essence of experience. Emerging from the perpetually creative brain of Dov ‘Balu’ Rosen (founding member of The Angelcy & Lo Dubim), the concept is very intriguing: in each performance a different ensemble of musicians performs blindfolded, in sets of improvised music, conducted by touch, with a different conductor for each set. It’s all about freedom, diversity, and the willingness to take risks. The music you hear is created in the moment. No one knows what to expect. But I’ll let you in on a secret: the ensemble is always composed of incredibly talented musicians from the independent music scene. Wherever the music takes you, it will be amazing. 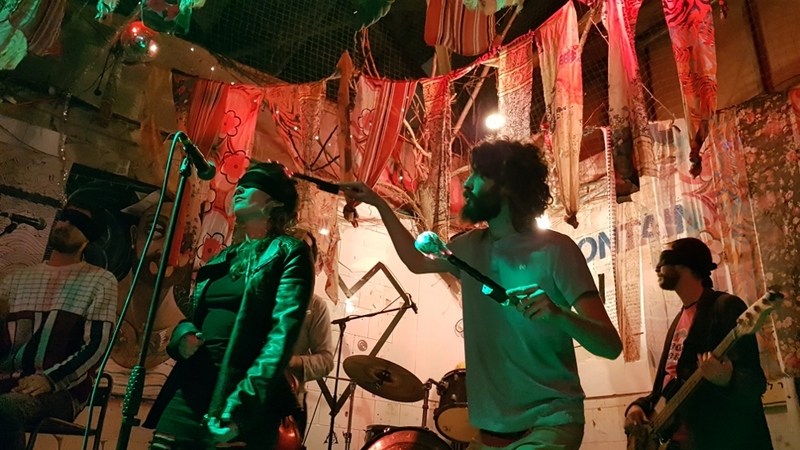 Saturday night at The Container in Jaffa the performers were: Shiri Shahar – vocals, Max Pink – vocals & percussion, Nadav Fast – electric violin, Dror Goldstein – drums & vocals, Nahdi Lazar – bass, Amir Manber – guitar, Dov Balu – drums. 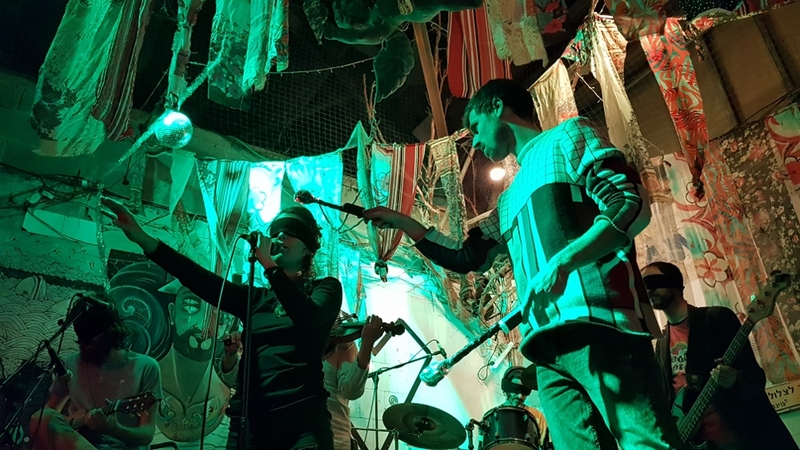 I have heard the Blind Orchestra before and loved what I heard, but Saturday night was immense. I’m still dazed and dazzled, flying on the music. Dror Goldstein was the first conductor of the evening, mellow and dreamy, dancing among the musicians, tapping them with the red blaze of the illuminated drum sticks. There was a relaxed groove, with a feeling of India in the air, layers of violin, drums, bass coming into the music, then Shiri singing: “where will it lead?” Max Pink on the bongos and suddenly I’m feeling a gypsy music vibe from the violin and then Max is singing: “it’s so nice that the weekend is over.” There is such a rush of sounds and feelings, the bounce of an Irish jig flows into a trance-like stream, then it’s all jumping with a surge of energy and Dov Balu is conducting, dancing, jumping, he’s everywhere. I’m in it, feeling it, loving it, and trying to take notes. A dreamy, ethereal chorus turns into something bright and vivacious. Shiri sings: “I want to dance.” The music gets wilder, fuller, funkier. Each conductor brings a different vibe. Max Pink opened his set with something quiet and lovely, guitars, violin, and soft touches of cymbals, then heating up the bass, and Max stepped off the stage, to contemplate the orchestra, listening and watching before making his next move. Live music is like nothing else on earth. It’s transcendent. I love to feel the rapport between musicians onstage (that’s why you’ll always find me right up there at the front). The way they look at one another, watching, waiting, connecting. But there are no visual cues in the Blind Orchestra. They cannot see the conductor or one another. Here, the listening is so deep. As one person begins to play, the others go there too, listening, moving to the music, feeling it, feeling one another, and feeling where it might go. The physicality of the experience is intense, a touch tells the musician to play, another touch means sing, a different touch means shine. Listening, feeling the music, I’m suddenly aware of the physical, sensual relationship between the musicians and instruments, the musicians and the music. Shiri’s voice is still singing in my head: “it all breaks and is made anew…” The music loud and intense, then later I hear something almost like a rollicking country tune, drums lit from within and violin with a Middle Eastern arabesque, and all coming into a shared rhythm, a quiet song, a celestial chorus with an earthy, raw feel. The beat intensifies, and there is something primal, insistent, vibrant in the music. There is no way to takes notes on this. Blind Orchestra is music unwritten, music played, lived, danced. 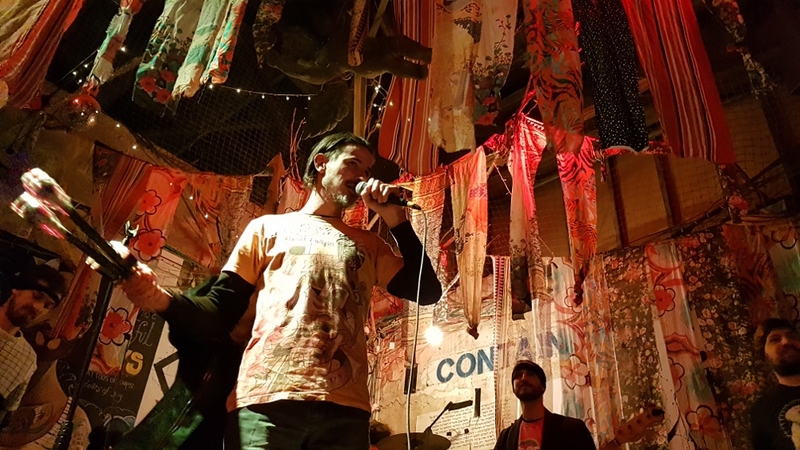 Blind Orchestra will be performing on Friday, February 22, 2019 at Beit HaYotzer (Hangar 22), Port of Tel Aviv. 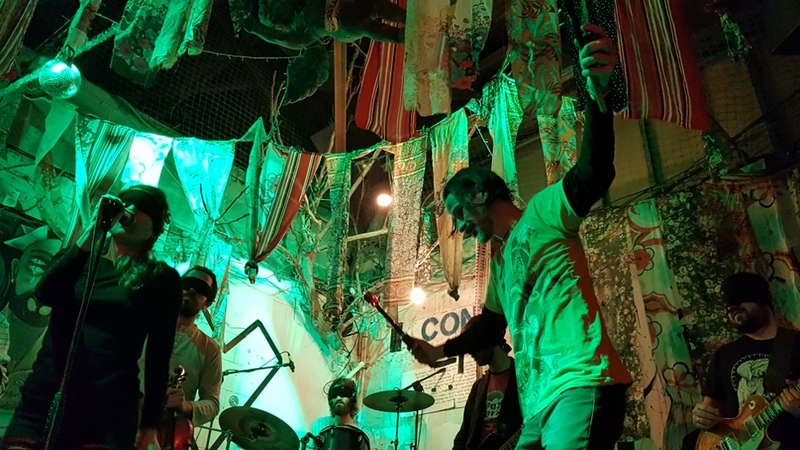 Featuring yet another great ensemble of musicians: Marianne Tur – violin, Dor Levin – drums, synths, Dvir Golan – saxophones, Nitai Marcos – bass, Eyal Tafesh – guitar, Freshon Ski – vocals, beatbox, Adi Gershon – vocals, Dov Balu – drums. Doors open at 21:30, show at 22:00. Tickets are 40 NIS – order online via this link. Check for updates on the facebook event.